2015 Topps WWE Undisputed Sting Printing Plate 1/1!!!! SiK Color!!! Looks even better in person!!! Extra Protected Shipping w Tracking!!! YOKOZUNA 2015 TOPPS WWE UNDISPUTED PRINTING PLATE CARD! 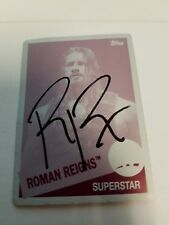 2018 Topps WWE Undisputed Sting Autograph Printing Plate 1/1!!!! SiKest Color!!! A Stunning Legend Plate Auto!!!! Excellent Condition!!! Serious Offers Only Please. Extra Protected Shipping w Tracking!!! The scanner light picks up all of the scratches on the toploader and sleeve. 2018 Topps WWE Undisputed Kane Printing Plate 1/1!!!! SiK Kane Plate!!!! Extra Protected Shipping w Tracking!!! 2018 Topps WWE Undisputed Adam Cole Printing Plate 1/1!!! SiK Color!!! Extra Protected Shipping w Tracking!!! 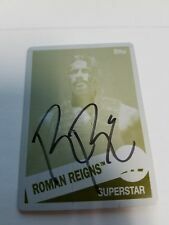 2016 Topps Undisputed WWE Roman Reigns Black Printing Plate Auto 1/1! It is a very cool card from a great product. Very cool item for any fan! Chatham, ON. Rockets Sports Cards. 5% GST for remaining residents of Canada. 12% HST for residents of British Columbia. ANY SPOTS OR FUZZ ON THE PICTURE IS ON THE SCANNER GLASS OR FROM THE SCANNER LIGHT AND NOT ON THE CARD.